Long Island City will continue to attract big-name tenants, dynamic entrepreneurs and educated professionals, despite the black eye the neighborhood took with Amazon’s abrupt withdrawal in February. 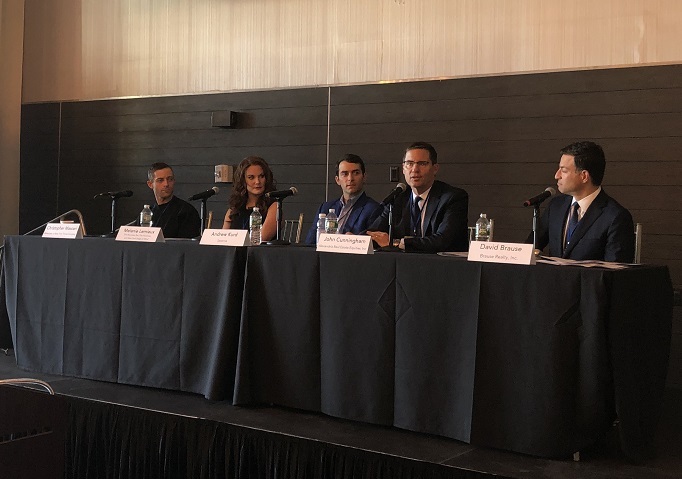 That was the view presented by some of Long Island City’s leading real estate executives who spoke before hundreds of attendees at the Long Island City Partnership’s 14th Annual Real Estate Breakfast this morning at the Ravel Hotel. Andrew Kurd, the managing partner of Savanna that owns One Court Square, told attendees that there were some positives that came from the Amazon debacle. Savanna was one of the hardest hit firms as a result of Amazon’s cancellation. The e-commerce giant had committed to take 1 million square feet of office space at One Court Square, as it looked to build out its Anable Basin campus. Amazon was going to take the space that Citibank said it was going to exit in 2020. The Amazon announcement led Citibank to accelerate its departure. Kurd said that there has been a lot of interest in the building since Amazon’s withdrawal. He said that Savanna is likely to announce two large lease deals in coming weeks, which will fill the Amazon hole. It has been widely reported that Centene, a St. Louis-based healthcare company, will be one of those companies– taking 500,000 square feet of the One Court Square property. “It’s been in the press but I can’t speak to anything,” Kurd said. “The interest proves what everyone believes…the fundamentals of Long Island City are still there,” Kurd said, referring to the area’s proximately to Manhattan, airports, relative affordability and tax advantages. He said that the fact that there were 500 attendees–a record– at the breakfast this morning spoke to that strength, comparing today’s meeting to the inaugural event 14 years ago when about 30 people showed. A good portion of the discussion dealt with One Court Square and its future. Kurd said that Savanna has big plans for the 110,000 square foot annex that sits alongside the 1.4 million square foot tower. The company is working on transitioning the space to a retail/community hub. “We are focusing on layouts and what the right uses would be and have had a number of conversations about food halls, gyms, bars and restaurants. We are focused on how we can create a town center within Long Island City. It is going to take some time…and we are working with our architects and consultants,” Kurd said. The Court Square Library is currently located in the annex and its lease will end later this year. Kurd didn’t say where things stood with the library, just saying Savanna has held discussions with Queens Library officials. The general mood at the breakfast was that Amazon was an unfortunate chapter but that the neighborhood will continue to move forward as it was prior to November. All I C is Money had it right . Those people helped ruin LIC and the neighborhood that was here and made it into a overcrowded, overpriced, glass tower land with no stores because of rents. Too many glass towers developers, too many. Did you hear that Rockrose and T.F. Cornerstone , Economic Development Corporation etc… No real affordable housing MR DumBlasio. This is the Democrats version of a city. Kick out the Middle class and poor. It doesn’t work. If a recession hits this will be more of a ghost town than it is now.also remember developers MORE parks, Schools and GREEN SPACE. Less planters in the middle of Avenues like Jackson Ave.. Let people turn coming off their blocks not just 1 way (right). Stop Trucks from parking all night illegally down Court Square West near parking garage and Courthouse, breaking up the street which has not been paved in 17-18 years. Thanks Mr.Van Bramer and Mr. DumBlasio. Sadly, every city in the world has the same story. The old, beautiful buildings and nice neighborhoods were leveled to make way for commercial skyscrapers with no character. I feel less sad for LIC than most places though as there are far fewer buildings worth saving and the distance to midtown sealed it fate long ago. Plus, it is getting new residential life. Not just a big office park. It did not have to be this way here in LIC. GREED took over. First King Bloomberg developed Manhattan into super rich territory. He then did the same to Brooklyn, He then hit LIC with some rezoning as in BKLYN and MANHATTAN. DumBlasio kept the Bloomberg ways despit running on a anti-Bloomberg platform. He is a LIAR and Cheat. Where is his Transparency along with Cuomo’s. Somewhere in a back room with Amazon. Both Dems have No INTEGRITY. Yeah, you’d only support politicans with tranparency right? I wonder why Trump has to hide his tax returns from everyone? If I “didn’t” like developers I wouldn’t have voted for one of them, even despite them being morally reprehensible? The Wall was a total failure, and deportations are down, but he promised that would change, right? Great to hear. I love developers like Trump building condos for the ultra-rich, like himself, it really brightens up the neighborhood. These people are the reason why Western Queens lost its neighborhood feel. They can paint LIC whichever way they want to. The truth is and the people who live here know it. his is a done deal. Developers and Real estate people don’t care about your commute. All the see are suckers from overseas or out of state and $$$$$$$$$ signs in their eyes. These greedy Developerss and Real Estate people will tell them stores are coming, but not really because rents are too damn high for businesses and real middle class and poor. The FAKE MRLIC wrote this comment. I love greedy developers, that’s why I voted for one for president. Well that and he told me brown people were scary. They should turn that building into a homeless shelter. But it would have been better with Amazon, jobs baby, jobs!! !